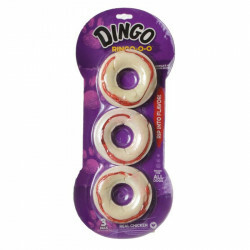 Dingo Ringo Meat & Rawhide Dog Chews are reinventing the wheel-shaped treat! 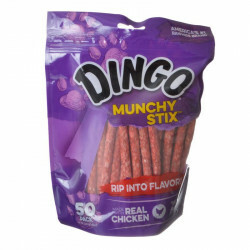 These fun chews are made with real chicken, rolled up in premium rawhide for incredible flavor and texture dogs love. And they're made with NO ingredients from China, so you can feel just as good feeding them as your pooch does chewing them. Dingo Ringos offer the same delicious taste as original Dingo Meat & Rawhide chews, but in a fun shape that's easy for dogs to pick up and grip in their mouths. 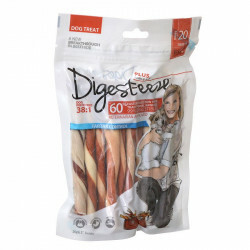 Ingredients: Rawhide, Chicken, Pork, Water, Dextrose, Potassium Sorbate (preservative), FD&C Red #40. 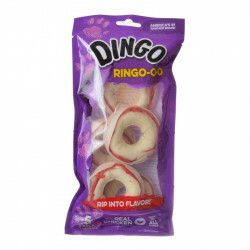 My dogs go through these bones fast so I love the bulk packaging and fast shipping!